Woman to Woman: Look Up! So if you're serious about living the new resurrection life with Christ, act like it. Look up, and be alert to what is going on around Christ--that's where the action is. Do your thoughts typically tip downward or upward? I have a naturally melancholy bent, which means I usually see the glass as half-empty. However, even the glass-half-full people I know and love struggle with downward-facing thoughts. The Bible clearly tells us that we need to look up to have God's perspective on our lives. Friends, this isn't always easy to do. But it's the only kind of thought life worth having. Otherwise we'll be continually held down in our trials and tribulations. Lately I've been asking God to give me his perspective on certain struggles. The more I seek his perspective, the more I understand his character. His patience is great--His timeline is longer and broader than mine, so I can have faith in him. His knowledge is perfect--I can only see small glimpses, but he sees the big picture in high definition. His comfort is peaceful--As I rest in his arms, waiting and hoping for change, he is tender and loving with me. Looking down on my struggles, I feel anxious, weary, strained and burdened. The opposite of peaceful. But when I look up, as this passage instructs, I truly experience peace, hope and joy even though my circumstances haven't changed. More than anything, I want to follow God's will and live out this new resurrection life in Christ. God is calling me to act like it first in my mind, where all my attitudes are formed. Then I can live it out in front of others with greater power, because I put on the mind of Christ instead of my own. He is showing me what to pursue and what to leave behind, as this passage indicates. I encourage you today: Look up instead of looking down. It's our human tendency, but it ties us to the world rather than to God. 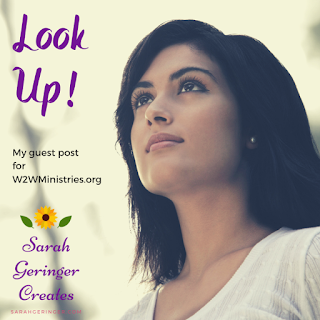 Look up when you have a quiet moment--literally lift your eyes to the skies and praise God for reigning over your circumstances. Ask him to give you his perspective and teach you about his character in the process. He will strengthen you and show you where he is already working, so you can join in on the action. 1. In which area do you struggle most with downward-tipping thoughts? 2. How can God's perspective on your most challenging situation help you gain more peace?